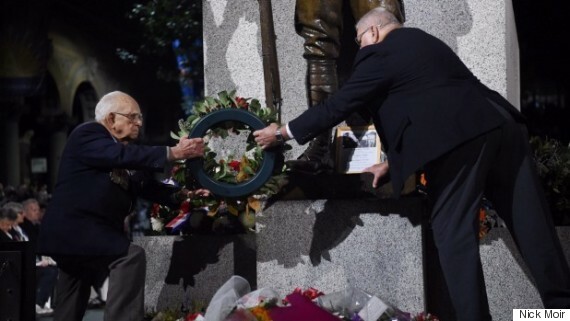 Australians made their way to dawn services across the nation on Monday to pay their respects to Australian servicemen and women, while also marking the 101st anniversary of the Anzac landings at Gallipoli. In Canberra, crowds of about 55,000 filled Anzac Parade with War Memorial director Brendan Nelson addressing the crowd, emphasising that the values of the Anzacs were ingrained in Australian culture now more than ever. An estimated 55,000 visitors gathered this morning at the Australian War Memorial for the 2016 Anzac Day Dawn Service. “102,700 Australians are named on the roll of honour. Like us each had only one life, one life to serve others and our nation. They chose us,” he said. “No Australians have worked harder nor given more to shape our values and our beliefs. “Young Australians and New Zealanders gave their all at Gallipoli and forged in bloody sacrifice the bond within which our two nations now live. An Australian soldier plays The Last Post. 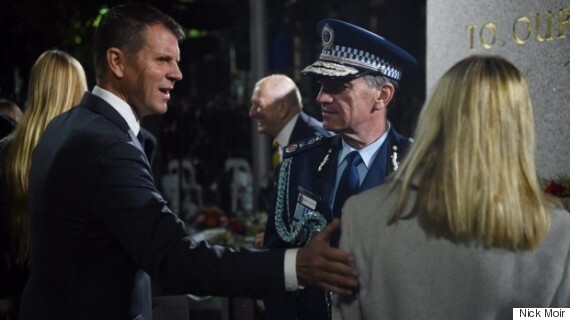 In Sydney, the Premier of New South Wales, Mike Baird, encouraged NSW residents to attend Anzac Day services across the state, despite the arrest of a teenager overnight on terrorism-related charges. 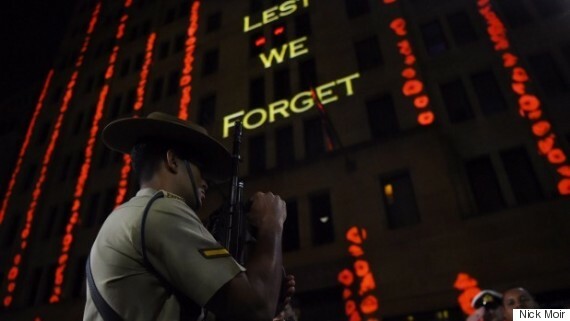 Anzac Day dawn service: Words are projected onto a building in Martin Place. 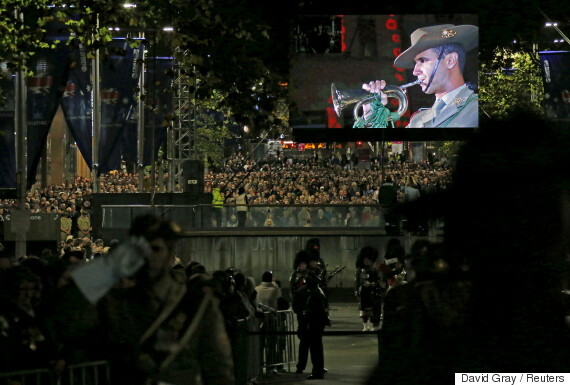 “My strong encouragement is if you are intending to go, go,” he said after the dawn service at Martin Place on Monday. “This is a day where we should be out there commemorating such a proud day of our history. NSW Premier Mike Baird, left, and Police Commissioner Andrew Scipione at the Anzac Day Dawn Service at Martin Place. Thousands gathered in Martin Place, where speakers recalled the campaigns by Australian troops in WWI, and particularly the move to the Western Front in 1916. Prime Minister Malcolm Turnbull attended a dawn service at North Bondi RSL club in Sydney before travelling to Canberra for the Anzac Day National Ceremony. 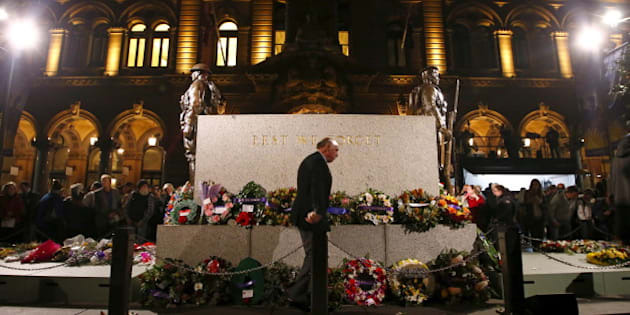 In Brisbane, Anzac square was overflowing with a 25,000 strong crowd that had already gathered in silence before the service. Queensland Governor Paul de Jorsey urged the crowd to show sensitivity to modern-day soldiers carrying the psychological scars of service. “Today we pay particular tribute to our dedicated and professional defence personnel, 2,200 currently overseas supporting Australia’s interests,” he said. On the Gold Coast, thousands also flocked to the popular beachfront service at Currumbin. At Melbourne’s Shrine of Remembrance, about 70,000 gathered with thousands of people walking solemnly through the city and along St Kilda Road before the service’s 5.40 am start time. Large services were also underway in Tasmania at Hobart’s Cenotaph and at Kingston Beach to the south of the city. Thousands also gathered in Adelaide and across South Australia to pay their respects, with the chairman of South Australia’s Anzac Day committee, Ian Smith, saying that on the 101st anniversary of the Gallipoli landings it was important to reflect on the tragedy of war, rather than military glory. 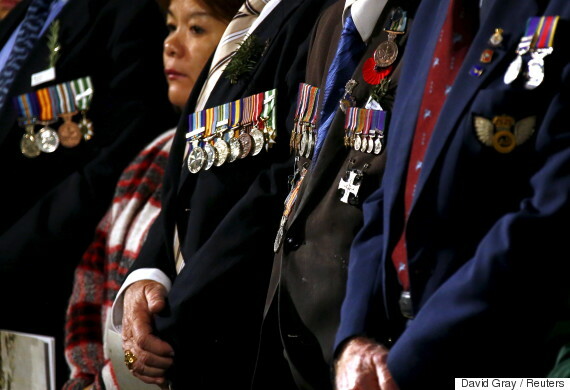 War veterans and relatives display their medals. “Australians took thousands and thousands of casualties and it really was a baptism of fire for the Australians on the Western Front,” he said.